An ailing human rights activist whose contribution to the campaign against juvenile executions in Iran is internationally recognised has been arrested to serve her six-year prison term. Last month an appeal court in Tehran reduced Mohammadi's earlier 11-year jail sentence to six years after finding her guilty on charges of spreading propaganda against the ruling system, acting against national security and membership of Iran's Defenders of Human Rights Centre (DHRC). As the deputy head of the DHRC, the 39-year-old activist and journalist was a close colleague of the Nobel peace laureate Shirin Ebadi who presided over the organisation. Mohammadi has developed an undiagnosed epilepsy-like disease since her previous arrest in 2010 when she was kept in solitary confinement in Tehran's Evin prison for a month. Her illness makes her lose control over her muscles temporarily during the day. Several other leading Iranian human rights activists are also being held in Evin, including the lawyer Nasrin Sotoudeh, who has represented several political activists and protesters arrested in recent years. Mohammadi, a mother of two and winner of the 2009 Alexander Langer award, is the wife of Taghi Rahmani, a political activist, who has spent a third of his life in jail. Rahmani has recently fled Iran in fear of further persecution. 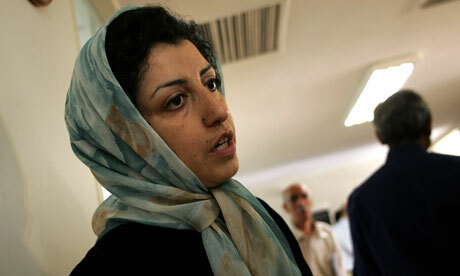 Mohammadi's arrest has sparked outrage among international human rights groups and organisations. The press watchdog Reporters Without Borders has strongly condemned her conviction. "She was detained in the northern city of Zanjan on 21 April after receiving an intelligence ministry summons and was transferred to Tehran's Evin prison to serve a six-year jail sentence," read a statement published on the RSF's website. "Mohammadi's husband, fellow journalist Taghi Rahmani, told Reporters Without Borders he is very worried about her deteriorating health," it said. "Rahmani, who has worked for many media since 1981, has also been constantly harassed by the security services and has spent a total of 14 years in Iranian prisons. He finally fled the country earlier this year." Speaking to the International Campaign for Human Rights in Iran (ICHRI), a US-based non-governmental organisation, Rahmani said: "Everyone is concerned about our two young children, and I worry a lot about them, too. But I know that my mother, my sisters and Narges's sisters will look after them. "More than the kids, right now I worry about Narges's illness. She has muscular paralysis, which is exacerbated under stress and pressure. I don't know what prison would do to her."